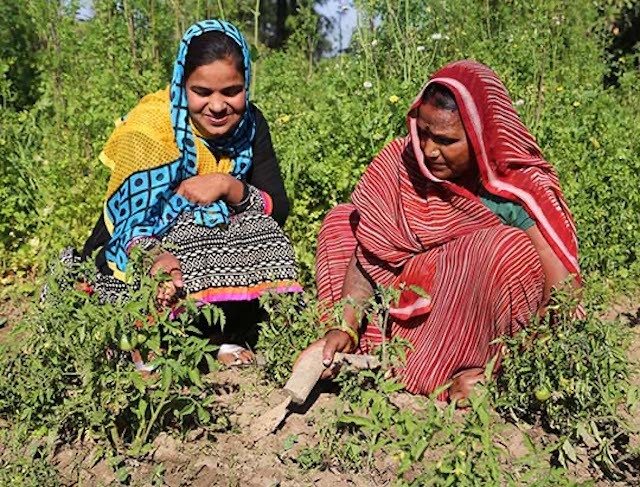 TechnoServe and the Kellogg Company are working with women in Madhya Pradesh to grow nutritious food for their families using climate-smart agriculture. 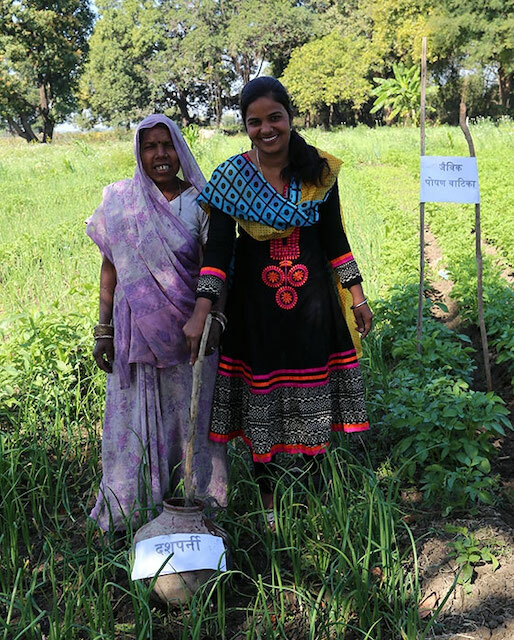 As a local resource person, Rachna Sharma (left) shows farmer Shanti Bai best practices for growing organic tomatoes in her kitchen garden. As a child, Rachna Sharma dreamed of becoming a teacher just like several male members of her family. However, she never expected to make this dream a reality, as girls were not allowed to work in her family. Little did she know that she would become a mentor to 300 local women, helping them to increase their families’ nutrition and establish their roles in family and agricultural decision-making. Women in my family traditionally do not work – at best, they help their husbands in farming...Now that I have a proper job and earn a living, it feels great! Rachna, who is 21 years old, is the oldest of three children, all of who live in their family home in Mala, a small village in Vidisha District, Madhya Pradesh, India. Her family farms wheat, chickpeas, lentils and other vegetables during the monsoon season. As is the case for many households in rural India, Rachna’s family believed that her place was on the family farm. However, while women in the region are highly involved in farming, they do not have a say in decision-making around the farm’s management, and are largely excluded from any role in the farm and family economies. So, while Rachna knew that her opportunities were limited, she continued to pursue her education, opting for open schooling when her parents were not comfortable allowing her to go to high school in a nearby town, and she is now pursuing a college degree through the same open schooling system. Rachna (second from left) stands with her parents and siblings in front of their home in Mala village in Madhya Pradesh, India. Rachna’s dream of becoming a teacher came to fruition through TechnoServe’s collaboration with the Kellogg Company, which seeks to improve the livelihoods of over 12,000 smallholder farmers in India through the promotion of climate-smart agriculture (CSA) techniques led by TechnoServe. This work supports Kellogg’s Global Sustainability Commitments to support a half million farmers by 2025, focusing on CSA to improve livelihoods. As research and TechnoServe’s past experience demonstrates, investing in opportunities for women leads to additional benefits at the household level and beyond; thus the initiative prioritizes the inclusion of women. In addition to training women farmers on CSA, TechnoServe and Kellogg identified an opportunity to increase the role women play in the farm economy while simultaneously enhancing the nutritional intake of participating households by training women in organic kitchen gardening. The project helps women to establish backyard gardens using organic inputs and farming practices for four nutritionally diverse crops at a time. With fresh produce at hand in the garden, women gain better quality vegetables without spending at market, saving travel time and money while diversifying their families’ access to essential nutrients. However, while many women were willing to implement gardens, finding local women to lead the training sessions was a challenge. In a region where women have not historically worked, there were no female volunteers, and women were not comfortable learning from a male technician. In order to initiate a cycle of change, TechnoServe’s village volunteer, Ratiram, went from household to household, searching for a woman like Rachna to hire as the project’s first local resource person (LRP). When Rachna expressed interest at the opportunity to become a female educator – and teaching other women, no less – the TechnoServe team supported her in reaching an agreement with her father. Such gender and family-specific arrangements are an important aspect of designing initiatives for social change. According to Rachna, the largest barrier for women’s opportunities in rural India is related to the belief that it is unsafe for women to go out alone. Rachna’s father agreed to allow her to take the position as an LRP on the condition that he or his brother accompany Rachna to her classes, and one of them is always in attendance at her training sessions. Once she began her work, her family was very supportive. The additional income was much needed, and Rachna’s parents and siblings are proud of the woman she has become. Similarly, it is important for the project to recognize that women juggle many responsibilities, and cannot attend every session. Rachna pays house visits and helps women who were unable to attend a class catch up, ensuring that they don’t fall behind due to family obligations. Rachna (right) demonstrates how to mix organic fertilizer to one of the women farmers in her group. Rachna has developed significantly as a professional over the past six months. 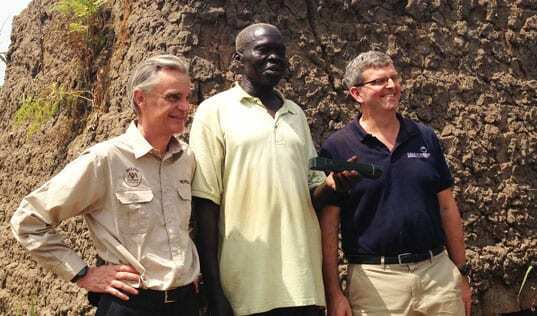 She received training on agronomy through the program, and her confidence speaking to crowds has increased. She now delivers training sessions every evening to one of her 12 groups, and is a valuable resource to a total of 300 students. While becoming an LRP has bolstered Rachna’s confidence, the women she trains are also experiencing change within themselves and their families. Bhuribai, a kitchen gardener from Kajaryai Village, explains how the knowledge gained through the program has helped her to grow as a farmer. Bhuribai and other women have found that their new expertise in organic fertilizers is an important first step towards playing a more inclusive role on the farm. While their husbands are generally in charge of selling the vegetables – the women cannot go to market alone – the use of homemade organic inputs allows the family to save money on chemical fertilizers. These inputs and best practices also increase yields from the kitchen gardens, which can then be sold at market for extra income. Despite the benefits Bhuribai has personally seen through the program, her family’s well-being never ceases to be her main priority. 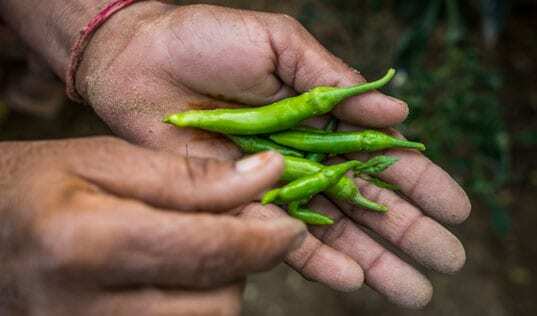 “The biggest advantage of the kitchen garden is that we get to eat organic vegetables at home that are full of nutrients and have no chemicals,” she says. 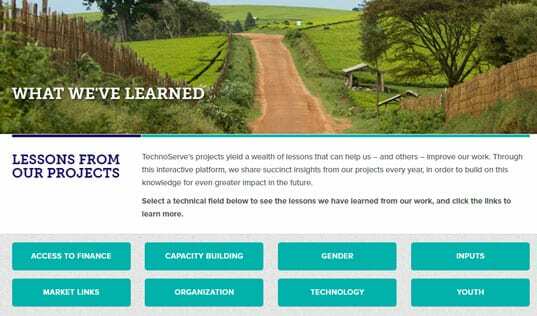 To date, TechnoServe and Kellogg have collaborated to train 2,060 women in kitchen gardening, and are recruiting more female LRPs now that Rachna has paved the way for future change-makers. Read stories of more kitchen gardeners here.